The pitch deck is a necessary tool to raise funding from investors for your startup. The quality of your pitch deck (both content and visuals) has a big impact on what investors will think about your company and if they see it worthy of investment. A successful pitch deck covers all the key elements of your business idea on 8 to 10 slides. Create your Pitch Deck - It's free! 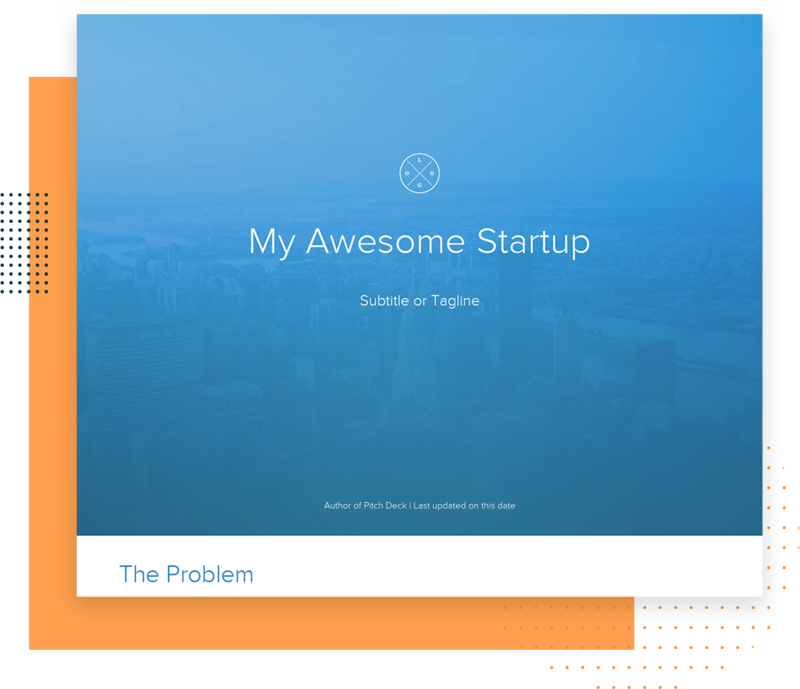 Your starting point to create and share a beautiful pitch deck, without any design experience. As the introduction to your pitch, this is where you will explain why your product or service exists by describing the critical problem that it solves. This problem plays a major role in grabbing the attention of investors. If you describe the problem accurately, you’ll connect with your audience by touching on a problem they’ve experienced in their own lives. Clearly define target audience’s frustration – use statistics and observations. How did you realize this frustration? Be a storyteller, share your experience. Focus on the “common” factor – You were spurred to create a solution because you saw the problem affecting others as well. How did you come to the conclusion that others are trying to solve this problem you observed? Does this problem apply only to a specific group or is it a broader issue? Where there’s a problem, there’s a solution. In this section, you want to highlight the features of your product or service and show how it works. This requires knowing your market and how where the value of your product fits into this market. How do you plan to solve the problem you’ve outlined? Is there already a solution to the problem? Or is the problem that the existing solutions are not good enough? Utilize the SWOT analysis for both your product and your competitors to get a broader look at the market and where your solution fits in. Diving into your competitors will help you outline why alternative solutions fail and how you can eliminate these failures. Once you identify the important factors that define your unique value proposition, you can highlight these benefits to investors. Remember, your idea may sound innovative but feasibility is the most important factor. Higher feasibility will result in higher interest of investors. Now that you underlined the problem and solution, it is time to reveal your unique value proposition. You should have a compelling message that explains why you are worth investing in. Bear in mind to use a simple language, meaning that it should be very clear and understandable. Quick tip: Use the Brand Positioning Canvas to help you define your unique value proposition. Here, you will need to examine other companies in the market. How are they dealing with the same problem, what is their solution and where does your product/service fit in this scenario? The best way to draw the scheme of competition in investor minds and to demonstrate it with clarity is to use visuals. 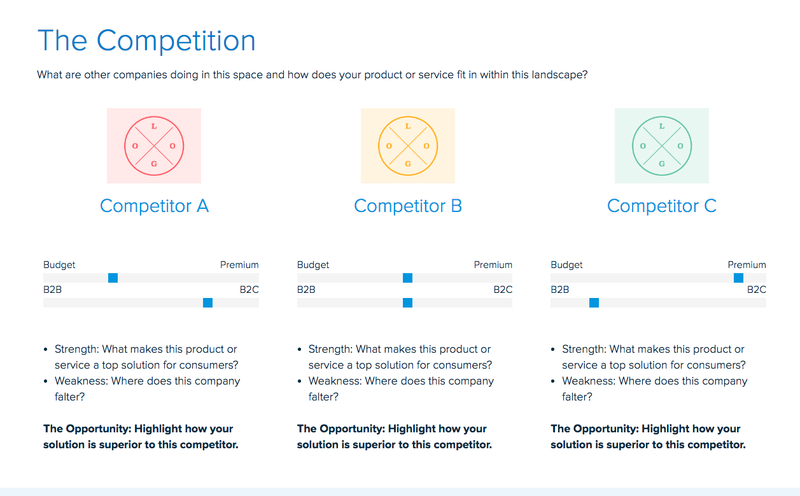 You can take advantage of the Competitive Analysis template to put your facts and research together before you implement them into your pitch deck. After displaying the competition, indicate the unique factors that give your company a competitive edge. What will set you apart and how did you define these advantages? Which uniques features does your product/service have? What is the adoption rate? Are you the first product on the market that is solving the issue? Or are you solving an old issue in a completely new, innovative way? What does your pricing model look like? Will it align with your target audiences’ budget to spend on solving the issue at hand? How do you utilize technology? Will you, now or in the future, consider potential partnerships? All of these elements will prove the strength of your market research. If you know these factors you will be more convincing and able to answer possible questions investors might have without hesitation. Use key metrics such as monthly active users, ARPU (average revenue per user), profit margins, etc… Showing these key metrics will prove that you are realistic in your approach and ready to establish your company further. If you’re pre-launch or do not have a minimum viable product yet, you may want to replace this slide with a Progress or Timeline slide to illustrate what you’ve done and what’s to come. You might also use financial predictions based on your business model. But, keep in mind that many startups fail as a result of a wrong business model. To be able to raise fundings, you will need a strong business model that assures financial success. Bonus: You can use Xtensio’s Business Model Canvas to define goals and collaborate easily with other co-founders. Have you ever heard the saying, “Investors don’t invest in the ideas, they invest in you?” Indeed, it can be all about business relationships and how passionate you appear when you speak about your idea. It’s not a one-person game. You will need a strong team of people who are in this together and ready to put their efforts in common goals towards the company’s future. Here’s the part you, in particular, have been waiting for! Time to score the investment to help your idea grow. What does your venture need to achieve the goals you listed on this deck? What would solve your company’s financial issues and get operations started? Clearly state why this particular amount is needed. Outline how long this amount will sustain your future actions. Explain where the investment will be spent using graphs. Include a timeline to show the company’s next big steps. The core elements of your company might stay the same, but time passes and you will probably need to update your values, dates, and even images as your company evolves. The pitch deck template is adaptable just like other Xtensio tools, it can and should be repurposed, revisited, and revised to suit your evolving needs. You can always add, delete, and move your modules and sections around with Xtensio’s versatile editor to adapt the pitch deck as you need it.